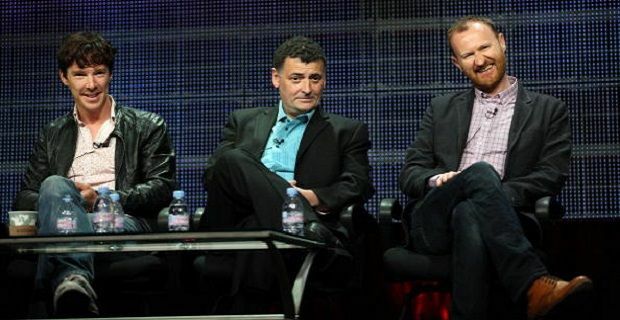 With the great detective set for a return to our screens on New Year’s Day, one of the show’s creators, Steven Moffat, has opened up about a mistake that he and fellow creator Mark Gatiss have learnt to accept. When the pair originally set out to create a modern version of Sir Arthur Conan Doyle’s classic stories they made each other the promise that the only reoccurring characters in the series would be those that Conan Doyle created, but Louise Brealey's performance as Molly Hooper in the pilot episode made them think twice. Gattiss echoed the thoughts of his writing partner: “It's a fascinating thing because it's a new idea. We were doing the pilot and I said, 'What if she has a boyfriend and Sherlock says he's gay?’” Viewers of the opening episode will know that her boyfriend turned out to be Holmes’ arch enemy Jim Moriety, so part of the complex relationship between the two men was created by Louise Brealey's interpretation of Molly. Turning his attention to the original stories Moffat said: “What you don't get a lot of in the original stories is, 'What do women think of him?’” Moffat explained that the female characters “don't talk much in the original stories. It doesn't happen much. There's Irene Adler who he barely meets in the original. There's Mrs Hudson who just brings tea in.” Molly’s character is a way of understanding Sherlock’s relationship with woman, which is something that helps bring the character to a modern audience. Sherlock returns to our screen on January 1st at 9pm on BBC One. If you can’t wait until then, a mini-episode will be broadcast via the red button on Christmas Day.